Doodling: Journey Into The Unknown! When I was in Kindergarten the big, strong, tall, 6th Graders made a Gigantic PaperMache’ of Dr. Martin Luther King. The Booger Picker Eater People Club meets tonight at 7pm. Groundhog Day is my favorite Holiday. 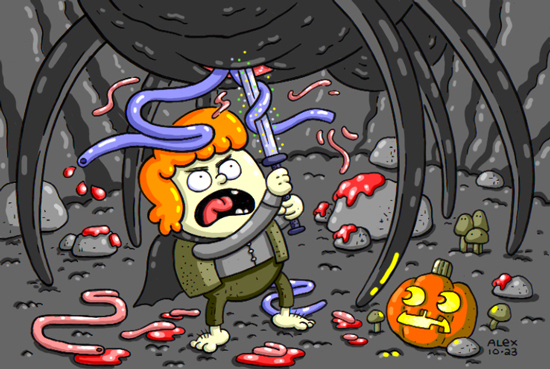 Today I drew Samwise Gamgee in the liar of Shelob Spider! I wanted to draw all of Shelob but I used tiny paper to draw a huge spider like a giant idiot.